A few days after my wife Lynn died unexpectedly in the summer of 2012, I picked up the phone one morning and found the 41st president of the United States on the other end of the line. He was calling to express his sympathy. That was so typical of George Herbert Walker Bush: it would have been simpler to direct his staff to send out a letter of condolence signed by a robo-pen. But he didn’t do things that way. Better the personal touch to try to comfort someone he knew was hurting even if it made the still-backbreaking daily workload of a former president that much heavier. He practiced what he preached about “kinder and gentler”. While slamming out urgents about Bush’s run up to war after the Iraqi invasion of Kuwait, and budget dealings that caused him to renege on his “No New Taxes!” pledge, was what kept my editors happy, I just might land an historical footnote for a less important effort - my broccoli scoop. I was sitting in my White House press room cubicle one day when a photographer told me the president was looking for me. He said Bush had stopped by the briefing room waving a Reuters story and pretending to be angry. Written not by me or anyone else on the Reuters White House team but by someone in the bureau, the story said California broccoli growers planned to send a truckload of the green vegetable to the White House as a publicity stunt after seeing an news magazine item that Bush had banned broccoli from meals on Air Force One. The photographer said Bush had declared in mock anger he didn’t want the shipment and wouldn’t accept it. There was a state dinner that evening for visiting Polish prime minister Thaddeus Mazowiecki and I covered the exchange of toasts. Afterwards Bush, who was in an ebullient mood, introduced me to Mazowiecki and asked what I wanted to know. “Well sir, as the representative of Reuters, I guess I’d better ask you about broccoli,” I said, teasing him about his outburst earlier in the day. Bush played along, saying he hated broccoli but had been made to eat it when he was a child. “But I’m president of the United States by now and by damn I don’t have to eat it any more!” he said. Bush jokingly asked Mazowiecki if Poland would take the broccoli shipment off his hands. Mazowiecki, who was probably unfamiliar with the vegetable, seemed bewildered by the banter. I wrote a three or four paragraph “bright” about the exchange, which got picked up by a lot of newspapers. The next day, Bush held a televised news conference and someone asked him about it. He responded with a tirade about the evils of broccoli, making his hatred of the vegetable an indelible part of his public image. I’ve never understood the disconnect between Bush’s public persona and what he was actually like. In reality, “41” was a war hero, excellent athlete, devoted family man, fun to cover. But he was perceived by many Americans as aristocratic, aloof and weak. Cartoonist Gary Trudeau, a fellow Yale alumnus, depicted Bush in the comic strip Doonesbury as a lightweight who had “put his manhood in a blind trust”. No doubt about it, Bush WAS preppie. He wore coloured watch wristbands, played tennis and golf and had a place in Maine where he liked to go boating. He was known for strange syntax. On the golf course, he facetiously called himself “Mr Smooth”. When he served in a tennis match, he “unleashed Chiang” - a reference to Chinese strongman Chiang Kai Shek, a hero of the Republican right. During one Maine vacation, he engaged in a day-long “pentathlon” with staff and press: golf, tennis, jogging, horseshoes and softball. This at a time when he was also getting periodic updates on national and international problems. Unlike a lot of politicians who are personable in public but distant and dour in private, the man friends called “Poppy” (his nickname in college) enjoyed life and was genuinely interested in others. A favourite memory: Bush and Czech president Vaclav Havel addressing a massive crowd in Prague’s Wenceslas Square in 1990. To my amazement, Simon Peller, a Reuters local correspondent, was Bush’s translator. It was emotional experience for Peller. He told me later he’d been beaten up in the square a year earlier when the Czech “Velvet Revolution” wrested the country from communism. Peller said it brought tears to his eyes to stand there with Bush and his country’s leader. He was especially moved that Bush quoted the words of Thomas Jefferson and Woodrow Wilson on freedom and liberty. These words inspired him and his countrymen during the dark days of communist oppression, he said. Bush had left a page of his speech behind on the podium and Peller had kept it as a souvenir. I suggested he give it to me and told him I’d get it autographed. I was on Air Force One for a flight to Germany the next day. When Bush came back to the press cabin to chat, I got him to sign the memento and told him of Peller’s comments about Jefferson and Wilson. I thought he, like me, would be impressed to learn of the power of American ideas. Bush was not into deep thinking that day. “When that guy told me we’d be doing consecutive translation, I thought, ‘Christ, we’ll be here all night!’” he said. I stayed in touch with Bush after he left office. I last saw him in Maine in August 2017. When my wife Becky remarked how well he looked at age 93, he nodded toward the seaside vista beyond his home and wryly replied: “Think I ought to try to swim across that bay out there?” We’d hoped to see him at least one more time, but will instead pay our respects at his funeral. He was a good president and a great human being. I’m privileged to have known him. 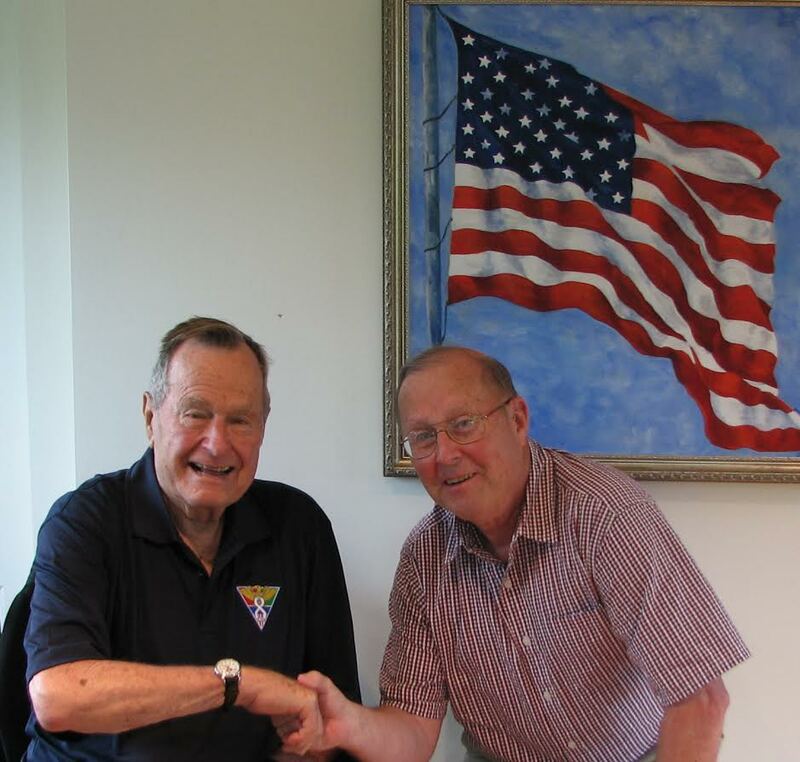 Steve Holland, Reuters current White House correspondent, adds: My first trip with President Bush was to his country estate in Kennebunkport in the dead of winter 1991. On the Friday night when we got there, Gene said, “Hey do you want to walk on the beach with the president tomorrow?” Sure, I said. “Great,” he said with a smile, “you have to meet at the pool at 6 am.” The next morning the temperature was in the 20s (F) and a breeze was whipping in at Goose Rocks Beach. I asked the press pool handlers, can we ask him questions? Sure, if you can keep up with him, was the reply. Bush, wielding a hiking stick and taking really long strides, took off at a hot pace. Terry Hunt of The AP and I ran alongside tossing questions at him and waving our tape recorders. After an hour, we were exhausted and I had sweat through my clothes. When I listened to the tape later to take down his quotes, all I could hear was myself shouting "Mr President!" and the sound of me gasping for breath. The wool sports coat I wore shrank from getting wet from sweat and I could never wear it again. But what a fun experience! Gene Gibbons was Reuters chief White House correspondent 1985-1998, covering Presidents Reagan, Bush and Clinton.